I have to believe that going into last Sunday’s game, that residents of Patriots Nation liked their chances against what had become a semi-dysfunctional Chicago team. But I, for one, was not anticipating a 51-23 blowout that wasn’t as close as the score may suggested. Perhaps the most difficult aspect of the proceedings for those writing or talking about it afterwards, was to select the best pun to describe it. I mean there was “loaded for Bear,” “unBearably easy” and the always popular “Bearly competitive” from which to chose. 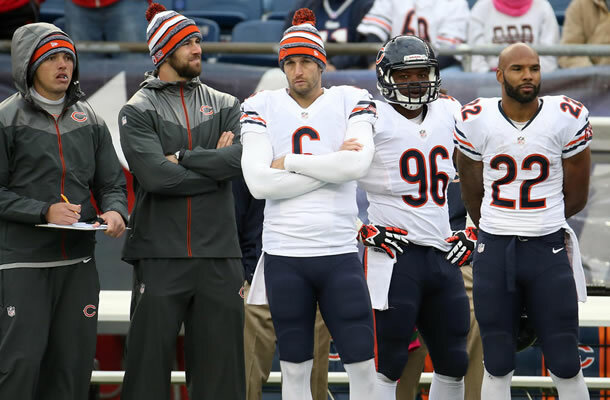 To top it off, when Chicago’s DL Lamarr Houston tore his ACL celebrating a sack in the closing minutes of the game, well, I have to assume most of their fans could no longer “Bear” to watch. For the Tom Brady-led Patriots offense, the same one so many of us were willing to bury after the disaster in KC, there was much to celebrate and be optimistic about regarding their upcoming battle against Denver. For starters, Brady continued his exceptional play, going 30/35, for 354 yards, and 5 TDs. The Pats had enough of a ground attack, especially early on, that the Bears had to respect it, slowing their charge and making the play action that much more effective. 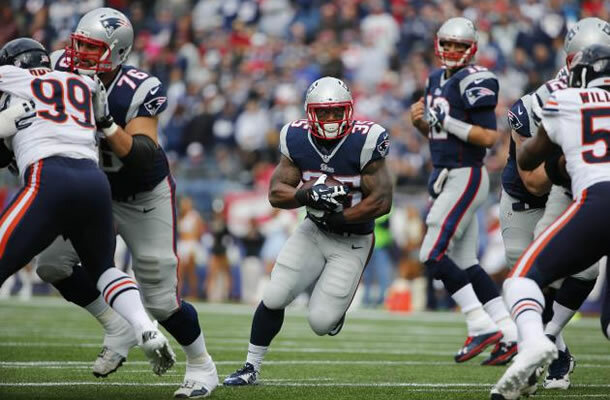 Most of that was provided by the recently rescued from the practice squad, Jonas Gray, with the 5’10”, 230 pound former Notre Dame back, running for 86 yards on 17 carries, with all-around back Shane Vereen providing another 22 yards on 5 carries. However, clearly the biggest story of the day, (if possible perhaps both figuratively, as well as literally) was the play of TE Rob Gronkowski, who before being sidelined by dehydration, collected 9 passes on 9 targets, for 149 yards, and 3 TDs. As outstanding as it was to watch Gronk totally outmatch the Bears’ secondary, Brandon LaFell‘s 11 catches on 11 targets, for 124 yards and 1 TD, may be just as important to the Pats success. It’s been obvious for sometime that NE needed a wide receiver, besides Julian Edelman that is, to step up, and apparently Lafell is doing just that. Of course, now that someone is stepping up, Edelman has apparently forgotten how to hold onto the ball, as he has had 4 drops in the last two games. Fortunately, TE Tim Wright continues to make himself at home, as he collected 7 passes on 7 targets, for another 61 yards and a TD. But the real bottom line in all this was the strong play of the offensive line of Senastian Vollmer, Ryan Wendell, Bryan Stork, Dan Connolly, and Nate Solder. What makes this grouping so unique is that Wendell and Connolly have both played center, making it possible for them to support the rookie Stork in his responsibilities of recognizing defensive alignments, and calling signals. This should come in handy if they are to contain a Broncos pass rush led by Von Miller and DeMarcus Ware. 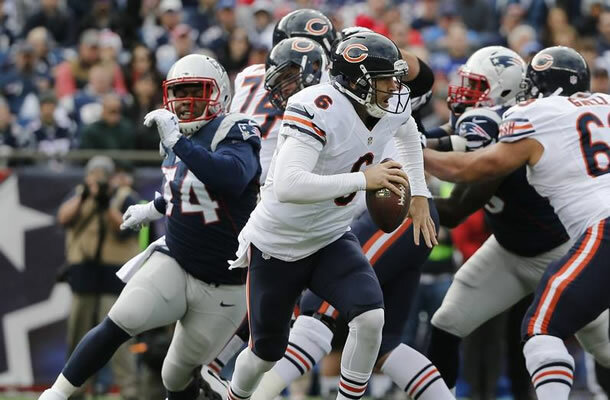 Although Chicago, led by Matt Forte‘s 114 yards, was able to run a little too easily against the Pats than most of us would have liked, there were still a few takeaways from the game with which the defense could be pleased. The biggest of these was the fumble recovery and score by their defensive MVP (in my estimation) Rob Ninkovish, which was part of the team’s 3 scores in 57 seconds (sounds like something Lincoln would have said…) at the end of the first half. The other was a pass interception by Darrelle Revis–his second of the season. In general, the secondary, led by the strong play of Revis and Brandon Browner, gives fans hope that the Pats may well be able to contain the Broncos and Peyton Manning next Sunday, as it is generally accepted that the best way to beat Manning is through coverage, and not necessarily pass rush. Get him patting the ball, and shuffling his feet, and he’ll be “singing do wah diddie…” in no time. Okay, maybe not the signing part, but the Pats may have two things going for them that could very well lead to the victory. Thing one is the previously mentioned pass coverage. Thing two is the weather, with the long range forecast calling for windy, chilly conditions. These are conditions which in the past have seen Brady thrive, but with which Manning has struggled. A few weeks ago I would not have given New England much of a chance of beating the Broncos. Even as late as last week, I was skeptical. Perhaps I’m putting too much stock in an easy win against a struggling team, but as of now I’m predicting the Pats will win a rather high scoring affair. Let’s say….37-34.